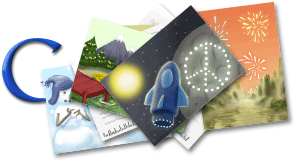 Google has been changing its own logo lately, often turning it into a series of doodles with a riddle attached. It seems we’re about to see another series of logo changes, but this time their purpose is quite easy to discern. 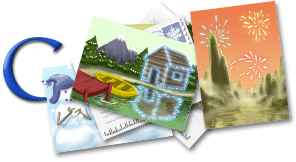 If you’ve visited Google today, you may have noticed that the logo has turned into a holiday postcard. 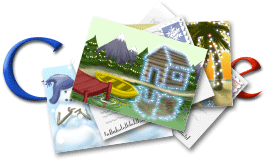 Clicking on it leads to a “Happy Holidays” landing page, with the current logo listed as the first in a series. 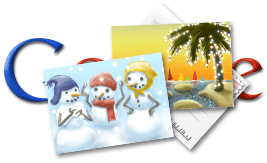 What can we say; thanks, Google, we wish you happy holidays, too! The Aztec calendar stone, Mexica sun stone, or Stone of the Sun (Spanish: Piedra del Sol), is a large monolithic sculpture that was excavated in the Zócalo, Mexico City’s main square, on December 17, 1790. Measuring about 3.6 metres (12 ft) in diameter, 1.22 metres (4 ft) in thickness and weighing 24 tonnes, the original basalt version is presently on display at the National Museum of Anthropology in Mexico City’s Chapultepec Park. Images from the Sun Stone appear on the reverse of Mexican peso coins of all denominations. This basalt sculpture is a representation of the Aztec calendar. Esperanto (help·info) is the most widely spoken constructed international auxiliary language. Its name derives from Doktoro Esperanto, the pseudonym under which L. L. Zamenhof published the first book detailing Esperanto, the Unua Libro, in 1887. The word esperanto means "one who hopes" in the language itself. Zamenhof's goal was to create an easy and flexible language that would serve as a universal second language to foster peace and international understanding. Esperanto has had continuous usage by a community estimated at between 100,000 and 2 million speakers for over a century, and approximately one thousand native speakers. However, no country has adopted the language officially. Today, Esperanto is employed in world travel, correspondence, cultural exchange, conventions, literature, language instruction, television, and radio broadcasting. At least one major search engine, Google, offers searching of Esperanto-related websites via an Esperanto portal. Saint Lucy, also known as Saint Lucia, (283 – 304) was a wealthy young Christian martyr who is venerated as a saint by Roman Catholic, Anglican, Lutheran, and Orthodox Christians. Her feast day in the West is 13 December, by the unreformed Julian calendar the longest night of the year; with a name derived from lux, lucis "light", she is the patron saint of those who are blind. Saint Lucy is one of the very few saints celebrated by members of the Lutheran Church among the Scandinavian peoples, who take part in Saint Lucy's Day celebrations that retain many elements of Germanic paganism. Saint Lucy is one of seven women, aside from the Blessed Virgin Mary, commemorated by name in the Canon of the Mass. Naguib Mahfouz (Arabic: نجيب محفوظ‎, Nagīb Maḥfūẓ) (December 11, 1911 – August 30, 2006) was an Egyptian novelist who won the 1988 Nobel Prize for Literature. He is regarded as one of the first contemporary writers of Arabic literature, along with Tawfiq el-Hakim, to explore themes of existentialism. He published over 50 novels, over 350 short stories, dozens of movie scripts and five plays over a 70-year career. Many of his works have been made into Arabic and foreign languages films. Qian Xuesen (simplified Chinese: 钱学森; traditional Chinese: 錢學森; pinyin: Qián Xuésēn; Wade-Giles: Ch'ien Hsüeh-sên) (11 December 1911 – 31 October 2009) was a scientist who made important contributions to the missile and space programs of both the United States and People's Republic of China. NASA documents commonly refer to him as H.S. Tsien. During the 1940s Qian was one of the founders of the Jet Propulsion Laboratory at the California Institute of Technology. During the Second Red Scare of the 1950s, the United States government accused Qian of having communist sympathies, and he was stripped of his security clearance in 1950. Qian then decided to return to China, but instead was detained at Terminal Island near Los Angeles. After spending 5 years under virtual house arrest, Qian was released in 1955, in exchange for the repatriation of American pilots captured during the Korean War. Notified by U.S. authorities that he was free to go, Qian immediately arranged his departure, leaving for China in September of 1955, on the passenger liner SS President Cleveland of American President Lines, via Hong Kong. He returned to lead the Chinese rocket program, and became known as the "Father of Chinese Rocketry" (or "King of Rocketry"). Asteroid 3763 Qianxuesen was named after him. Elzie Crisler Segar (December 8, 1894 – October 13, 1938) was an American cartoonist, best known as the creator of Popeye, a character who first appeared in 1929 in his newspaper comic strip Thimble Theatre. Segar was born and raised in Chester, Illinois, a small town near the Mississippi River. The son of a handyman, his earliest work experiences included assisting his father in house painting and paper hanging. Skilled at playing drums, he also provided musical accompaniment to films and vaudeville acts in the local theater, where he was eventually given the job of film projectionist. At age 18, he decided to become a cartoonist. He worked hard on a correspondence course in cartooning from W.L. Evans, of Cleveland, Ohio, in which he had invested $20. He said that after work he "lit up the oil lamps about midnight and worked on the course until 3am." Segar moved to Chicago where he met Richard Felton Outcault, creator of The Yellow Kid and Buster Brown. Outcault encouraged him and introduced him at the Chicago Herald. On March 12, 1916, the Herald published Segar's first comic, Charlie Chaplin's Comedy Capers, which ran for a little over a year. In 1918, he moved on to Hearst's Chicago Evening American where he created Looping the Loop. Segar married Myrtle Johnson that year; they had two children. He died at age 43 after a long illness. In 1968, the United Kingdom announced its decision, reaffirmed in March 1971, to end the treaty relationships with the seven Trucial Sheikhdoms which had been, together with Bahrain and Qatar, under British protection. The nine attempted to form a union of Arab emirates, but by mid-1971 they were still unable to agree on terms of union, even though the British treaty relationship was to expire in December of that year. Bahrain became independent in August, and Qatar in September 1971. When the British-Trucial Shaikhdoms treaty expired on December 1, 1971, they became fully independent. Union of Transylvania with Romania was declared on December 1 [O.S. November 18] 1918 by the assembly of the delegates of ethnic Romanians held in Alba Iulia. The national holiday of Romania, the Great Union Day (also called Unification Day) occurring on December 1, commemorates this event. The holiday was set after the 1989 Romanian Revolution, and marks the unification not only of Transylvania, but also of the provinces of Banat, Bessarabia and Bukovina with the Romanian Kingdom, in 1918, the Union of Transylvania with Romania being the last event, sealing the unification of the country.